This film captures brilliantly the sights and sounds of the annual celebration of Mr Punch's birthday in the heart of London at the May Fayre in Covent Garden. Commissioned by the Punch and Judy Fellowship and the organisers of the event, Alternative Arts. Expertly introduced by John Styles MBE, it will fascinate anybody with an interest in popular puppetry. We see and hear from the many performers. 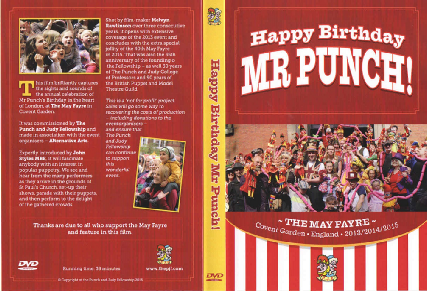 Professionally shot and produced by film maker Melvyn Rawlinson, this DVD is an important archive of the May Fayre from 2013 to the fortieth anniversary of the event, the thirty-fifth anniversary of the founding of the Punch and Judy Fellowship in 1980, thirty years of Punch and Judy College of Professors and ninety years of the British Puppet and Model Theatre Guild in 2015. £20 plus postage and packing.